This band was very well known throughout the West Midlands in the early 1960s and remains significant due to some of the players becoming founding members of The Move. In 1958 a skiffle group called the Vikings was put together by Terry Wallace from Nechells, Birmingham. The group’s lead vocalist was George “Duke” Mann whose younger brother Johnny Mann also joined as guitarist. The Vikings became a rock ‘n’ roll band but eventually Duke Mann was forced to leave and do National Service with his place being taken by Robert Hughes whose stage name was Bobby Valantine. The Vikings began to establish a reputation around Birmingham as an exciting live act when tragedy struck and their lead guitarist John Kirby was paralysed in a car accident. Their lead vocalist Bobby Valentine decided to leave and his place was taken by Keith Powell whose father also became manager of the group (see Keith Powell and The Valets). Colin Tooley was born August 18, 1943 and lived in Hodge Hill, Birmingham. His first band was called The G-Men who formed in the late 1950s during the skiffle craze and they arranged dances at The Curzon Coffee Bar and in a church hall with Colin handling the takings at the door. He remembers his pockets becoming so filled with half crowns that he had difficulty in keeping his trousers from falling down. At this time he was singing and playing bass guitar although his ability to play the instrument was apparently questionable! Colin Tooley turned professional when he joined Keith Powell and The Vikings in 1961 as replacement singer when Keith Powell became ill and was unable to complete some bookings. For the role of frontman, Tooley changed his name to Carl Wayne complete with a pink suit and was met with such success that when Powell returned, Carl Wayne was allowed to stay and perform regularly in the group as second singer with the band’s name being changed to “Keith Powell, Carl Wayne & The Vikings”. so Keith left along with his father who was the group’s manager, and later formed the Valets (see Keith Powell and The Valets). Carl Wayne took over as frontman and in January 1963, the Vikings were sent over to play bookings in Germany for six months. themselves as one of the city’s top live acts along with Mike Sheridan and The Nightriders and The Spencer Davis Group. Carl Wayne and The Vikings were signed to the Pye Records label in 1964 and recorded What’s A Matter Baby at Hollick & Taylor Studios in Handsworth as their first single. Soon after, bass guitarist Barry Harbor left the band and was replaced by Chris Kefford from a group called the Chantelles who joined just before the release of their second single. Chris “Ace” Kefford was born on December 10, 1946 and was from Yardley Wood. His first band was called Chris and The Shades, a line-up that was put together by his older uncle (also named Chris). 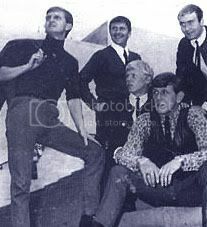 They later became Steve Farron and The Chantelles but had disbanded by the end of 1963 and Chris along with his uncle joined Birmingham singer Danny King’s backing group for some bookings as “The Jesters”. To avoid name confusion with his uncle, the youngest Kefford took the stage name of Ace the Bass which soon stuck. and was composed by Danny King who also duetted with Carl on the vocal but neither of the singles sold enough copies to make the record charts. only but met with little interest there. 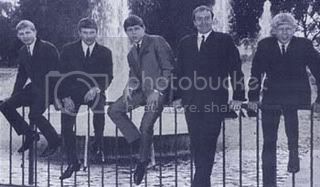 After the cancellation of their record contract, Carl Wayne and The Vikings secured more bookings in Germany in early 1965, but before they were to leave, drummer Dave Hollis left and was replaced by Bev Bevan who had played in a well known local group called The Diplomats (see Denny Laine and The Diplomats). Carl Wayne and The Vikings departed for Dusseldorf and Cologne but the working conditions in Germany were gruelling by this time and they soon returned to Birmingham and secured a residency at The Cedar Club on Constitution Hill. In the mid 1960s in Birmingham, the Cedar Club was the place to go and see the “happening” acts. Other local bands who performed there regularly was Danny King and The Mayfair Set and Mike Sheridan and The Nightriders. Various members from these three groups would sometimes get together on stage for spontaneous jam sessions. Davy Jones & The Lower Third from London were performing at The Cedar Club one evening late in 1965 and their singer (who would later change his name to David Bowie) mentioned to Trevor Burton from the Mayfair Set and Ace Kefford from The Vikings that they should consider forming their own group. Roy Wood from Mike Sheridan and The Nightriders was also interested in this idea and when Ace Kefford informed Carl Wayne of their plan, Carl offered his services as frontman. Bev Bevan was chosen as the drummer(John Bonham who was at the time playing with Kefford’s uncle’s group Way Of Life was also asked but turned them down. Bonham would shortly join Robert Plant’s group Band Of Joy). In this way The Move was formed but for the Vikings – a Birmingham rock ‘n’ roll institution since the 1950s – it was the end. Guitarist Johnny Mann became Roy Wood’s replacement in The Nightriders and Terry Wallace joined Mike Sheridan’s New Lot (see Mike Sheridan and The Nightriders) and continues to perform occasionally around Birmingham to this day. Hi, my dad was terry wallace, founder member of carl wayne and the vikings back in the 60s. They played very often at the town hall and would love to find out if any old advertising posters still exist with them on it. Who can i cantact to find out any info on this? 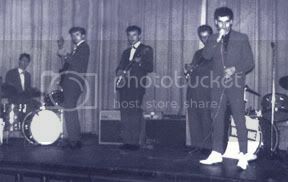 The original Vikings was formed in 1958 by John Badrick and Terry Wallace and I was the original singer the line up was John Badrick, singer and guitarist Terry Wallace, Terry Smith, George Jenkings, we played at the Birmingham hippodrome and the Town Hall . Playing washboard at the very start and then standing up with a snare drum before I got my father gauantee me for a set of Premier drums.And don’t forget Johnny Jolley who took over on bass when Terry Smith joined the army.The best times I remember was travelling to gigs in the old V eight Ford with all are kit on the back and we crammed inside Big Ronnie driving. Hi everyone. I have a card from when I was in Nicosia in 58 till 60.